JACKSONVILLE, AL (April 30, 2017) –Multi Grammy Award-winning country band Alabama are going back to their roots for a good cause. For the first time ever and for their only appearance in Alabama this year, the band will be headlining Burgess-Snow Field at Jacksonville State University’s JSU Stadium with their close friends and many special guests for an unforgettable once-in-a-lifetime event. The Country Music Hall-of-Famers will be donating all concert proceeds after expenses to Jacksonville State University for tornado relief after an EF-3 level storm tore through Jacksonville and the JSU campus in March 2018. 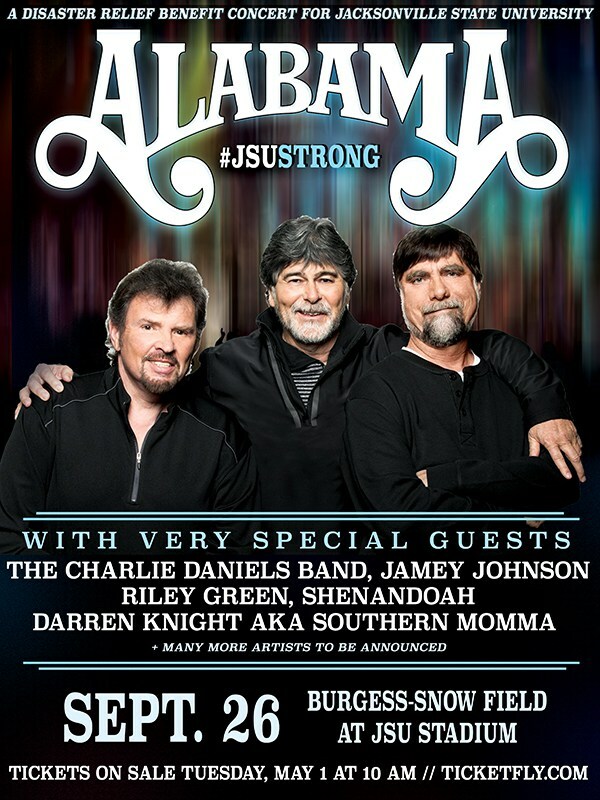 Alabama has recruited an all-star lineup of very special guests including the Charlie Daniels Band, Jamey Johnson, Shenandoah, Darren Knight “Southern Momma” and many more surprise artists to be announced. Tickets go on sale Tuesday, May 1 at 10:00 a.m. at Ticketfly.com or by calling (877) 435-9849. Tickets start at $25, plus applicable fees. Net proceeds to benefit the Jacksonville State University disaster relief fund. Forty years since starting the band, Alabama has charted 43 #1 singles including 21 #1 singles in a row and have won over 179 CMA Awards, Grammy Awards, and ACM Awards. They are members of the Country Music Hall of Fame and have their own star of the Hollywood Walk of Fame. Alabama introduced rock style guitars, lights, pyrotechnics and sounds to the country audience. This inspired many of today's brightest country stars including Kenny Chesney, Jason Aldean and Luke Bryan. Randy Owen, lead singer of Alabama, has a lifelong connection to Jacksonville State University and is devoted to giving back to the community that gave so much to him. Just as we did with the Alabama Fundraiser Concerts when the 2011 tornadoes hit, we continue to want to help. And one way we can help is to do what we do best, play music with our friends and raise money for the university repairs. When I asked my bandmates and cousins Teddy Gentry and Jeff Cook, whose wife Lisa is also a JSU alum, they were both thrilled to pitch in and help out.